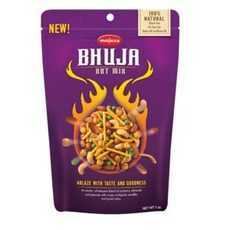 Enjoy Bhuja Nut Mix. Blend Of Cashews, Almonds And Peanuts. Made With Sunflower Oil. Contains Crispy Multigrain Noodles And Green Peas. Trans Fat Free; Gluten Free; All-Natural. (Note: Description is informational only. Please refer to ingredients label on product prior to use and address any health questions to your Health Professional prior to use.